RONKONKOMA, N.Y. — Nature’s Bounty, the makers of the No. 1 brand for Hair, Skin, and Nails, Thursday announced the launch of its premium beauty supplements, Nature’s Bounty Beauty Gels, at Ulta stores and Ulta.com. The softgel line is scientifically formulated to address a woman’s key wellness needs from within, including skin complexion, elasticity and healthy aging and is the company’s most recent innovation in its leading beauty portfolio. The traditional vitamin category continues to see steady and dynamic growth, and beauty supplement sales are expected to reach a staggering $6.8 billion by the end of 2024, according to a report by Goldstein Research, a consulting and marketing research firm. Nature’s Bounty has been the pioneer in this space – having driven growth in the category since 2009 with the launch of its Hair, Skin & Nails line. Given the growing consumer demand, Nature’s Bounty specifically developed the softgels to help bridge the usage gap between traditional vitamins and premium beauty products. • GoodnightLovely: Taking beauty sleep to a whole new level, Nature’s Bounty GoodnightLovely Beauty Gels are an innovative supplement that supports both sound sleep‡ and overnight skin hydration at the same time. With 3mg of Melatonin per serving, GoodnightLovely works in harmony with your natural sleep cycle so you can awaken feeling refreshed and revitalized. While you’re snoozing away, the hydrating Hyaluronic Acid ingredient will be working hard to help your skin maintain moisture and skin hydration. • SkinElasticity: Helping you feel radiant at any age, Nature’s Bounty SkinElasticity Beauty Gels support healthy aging and skin elasticity. The innovative formula utilizes key nutrients to support skin elasticity, including Vitamin A for healthy skin, and the proprietary ingredient FloraGLO, a lutein formula that serves as the skin’s nourishing defense to help promote elasticity. • MoistureTreat: New Nature’s Bounty MoistureTreat Beauty Gels are an innovative way to hydrate dry skin from the inside, out. With Hyaluronic Acid to help maintain moisture and Vitamin E, a primary antioxidant found on the outermost skin’s surface, this hydrating formula is excellent for those with occasional dry skin. • ClearComplexion: With skin-clarifying zinc and manganese for antioxidant support, new Nature’s Bounty ClearComplexion supports a clearer complexion for people with non-cystic acne. • GlowOn: Designed to help promote a healthy, youthful glow, the illuminating Nature’s Bounty GlowOn formula contains Ceramosides, an extract from wheat seed that improves skin smoothness by helping with fine lines. Additionally, Nature’s Bounty GlowOn Beauty Gels contain the antioxidant Resveratrol which helps fight against cell-damaging free radicals. 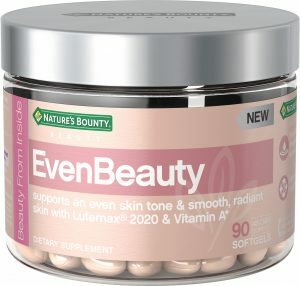 • EvenBeauty: These innovative softgels help maintain smooth, radiant skin thanks to key ingredients Vitamin A Retinyl Palmitate and Lutemax 2020, a nourishing Lutein formula derived from marigolds, that helps maintain even-toned skin and support healthy aging. 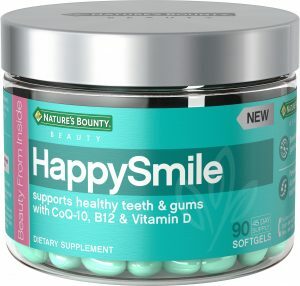 • HappySmile: Nature’s Bounty HappySmile Beauty Gels contain CoQ-10 to promote oral health from the inside, out. The innovative, preservative-free formula also includes Vitamin B-12 and Vitamin D, a power duo that supports healthy gums and teeth.